The shishosetsu is a Japanese form of autobiographical fiction that flourished during the first two decades of this century. 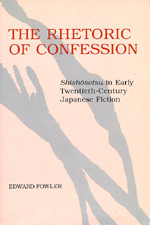 Focusing on the works of Chikamatsu Shuko, Shiga Naoya, and Kasai Zenzo, Edward Fowler explores the complex and paradoxical nature of shishosetsu, and discusses its linguistic, literary and cultural contexts. Edward Fowler teaches in the Department of East Asian Languages and Literatures at the University of California, Irvine.